GREENWOOD VILLAGE, Colo., Feb. 5, 2019 /PRNewswire/ -- Red Robin Gourmet Burgers and Brews is fueled up and ready to hit the open road. The casual dining restaurant famous for serving more than two dozen craveable, high-quality burgers and bottomless sides is kicking off its 50th Anniversary Celebration with the Forever Yummm Food Truck Tour. The custom-built truck is embarking on a three-and-a-half-month, 9-state tour to treat fans to free samples of Red Robin's signature steak fries, a guest favorite for five decades. "Red Robin has been serving up Bottomless Fun and Gourmet Burgers for 50 years and we look forward to bringing the Yummm for 50 more," said Denny Marie Post, president and chief executive officer. "Through the years, while the restaurant has changed, and the menu has evolved, the brand continues to meet the needs of generations because we infuse fun, creativity and innovation into everything we do. It's what keeps our guests smiling and Red Robin Forever Yummm." Red Robin's Forever Yummm Food Truck was unveiled in Denver at the brand's annual Leadership Conference and has officially begun its 9,200-mile journey across the U.S. To pay homage to the city where it all began, the truck started its journey in Washington and will navigate its way south to Oregon, California and Arizona before heading east to North Carolina and New York. The truck will pass through Michigan and Oklahoma with its last stop in Colorado in early April. To further celebrate 50 Years of Yummm and the road ahead to 50 more, Red Robin is encouraging consumers to share their iteration of its infamous "Red Robin… YUMMM®!" jingle. Renditions shared on Instagram and Twitter using #RR50Contest from Feb. 1 through March 22 or captured during one of the Forever Yummm Food Truck Tour stops will be featured on www.foreveryummm.com. Red Robin will also select the top 50 entries with fun prizes and award one final grand prize of Red Robin for 50 years. 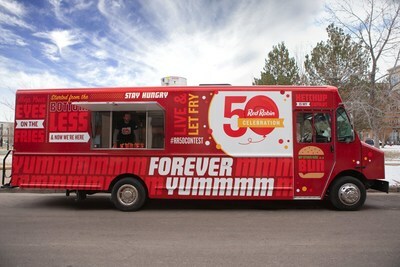 "The fully functional food truck is designed to allow fans to experience all the Yummm and fun surrounding Red Robin's 50th Celebration," said Amy Woolen, vice president of brand marketing. "It's highly approachable and gives people a reason to join in on the fun and celebrate this milestone with us."